The mid-century style chapel is a small worship space. Like most spaces of that period, it had very few architectural or decorative details rooted in traditional liturgical subjects or iconography. Canning designers were engaged to redesign the chapel. We were able to make reference to traditional architectural details, like a gothic boss, with a new interpretation that blends seamlessly with the mid-century modern lines. 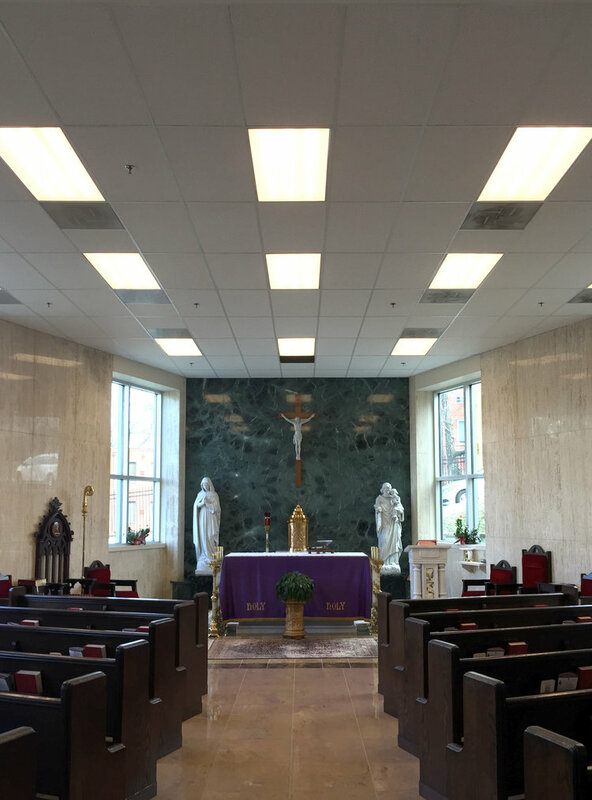 We replaced the drop ceiling and fluorescent lighting with Baswaphon seamless acoustical plaster that provided the substrate for the decorative ceiling elements. Three sacred-subject, fine-art murals were created for the chapel, and a new crucifix selected to complete the reintegration of traditional elements into the modern interior.